Florida, home to the Gators and the non-stop beaches that line the beautiful coast of the state. The Sunshine State has been the destination for millions of Americans who seek fun in the sun year around, and when it comes to vacationing there is not a more unique or fun spot to head to. The Hard Rock Cafe is known coast to coast as the destination for rock n roll junkies to get a great bite to eat while they take in some rock n roll heritage. The Hard Rock Cafe located at 313 Duval St, Key West, FL 33040-6565 is no different. With a theme that reads 'love all serve all' across the top of the bar this destination is truly a unique experience. The Hard Rock Cafe Key West is located right within walking distance to the beach, and although there are no alligators around you can definitely feel the Florida vibe going on here. 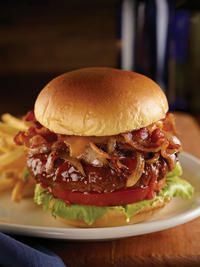 The menu is the traditional Hard Rock Cafe fare, with a lot of different burgers and a selection of wings that will knock your socks off. The staff at the Hard Rock Cafe is always enthusiastic, and they also have a keen knowledge of the vast selection of alcohols that can be found at the Hard Rock Cafe bar. The Hard Rock Cafe Key West lives up to the hype of the Hard Rock brand, they combine a unique dining experience with a high energy staff and stellar food selection. Visiting the Key West area anytime soon? You'll be hard pressed to find a better burger with a more unique dining experience then the Hard Rock Cafe Key West. Enjoy a prix-fixe menu at the Hard Rock Cafe in Key West, Florida. Each meal comes with a dessert and your choice of tea, coffee or soda. See the Sample Menu below for entrée options.